The EPA estimates that if Americans went green in the laundry room, they'd save three trillion gallons of water annually, along with over $18 billion per year. The laundry room is a place where we seem to spend a lot of time -- the agency's statistics show that the average household runs over 400 loads annually, which is more than one a day! A few simple practices in the laundry department can help you save energy, resources, and, our favorite thing, cash. No, we're not suggesting that you let your clothes sit in a soggy pile until they rot. But if you have fair weather, take advantage of it, and hang your clothes outside to dry. This also reduces wear and tear on your garments, making them last longer, which offers additional environmental benefits, since you won't be replacing them as quickly. Many people forget to check and account for the load size when they're throwing a load into the wash. Even a high efficiency washer (recommended for additional energy savings) can't work as well when you have the wrong load size set, so dial back the size if you're doing a small load...or increase it when you have a lot of laundry. If your washer doesn't allow you to choose the load size, talk to your Phoenix plumber about installing a new washer with more environmentally friendly options. You may have spent your whole life being told to painstakingly separate laundry, but we'll let you in on a little secret: you can wash pretty much everything on cold or warm without having to worry about it. For new dark garments, it's a good idea to wash on cold without light colors at least once in case they bleed, but you don't need to be as careful about separating laundry the rest of the time. Instead, combine loads to do one big load instead of two smaller ones, which will save you some serious water. The smaller the item, the more the packaging. Packaging is a major contributor to waste, but it doesn't have to be if you buy smart. Buying items in bulk and choosing concentrated detergents won't just cut down on packaging: it will also save you money. We discussed it briefly above, but, seriously, use cold water for washing. The heat of the water isn't as important as the use of detergent and the wash cycle to agitate dirt and grime. According to the EPA, 90% of the energy used in washing is spent heating water, which is often needless. Guess what? Washing in hot water wears clothes faster and sets stains, too. Cold water is generally superior, unless hot water is specifically recommended: as for example when you're washing fabric to get rid of microorganisms like scabies. When you have to use the dryer, be smart. Having a problem with residue and static? Try adding some vinegar to your rinse water instead of using dryer sheets. Try using dryer balls to contain static--you can make your own with balls of wool! Want your clothes to have a fresh scent? Add a lavender sachet during the dry cycle. Even better than going bulk and concentrate: make your own laundry products. You get to control the ingredients, and the results will be less expensive and more environmentally friendly. 8. Is it actually dirty? Lots of clothes can be worn multiple times before washing, especially jeans, skirts, and pants. 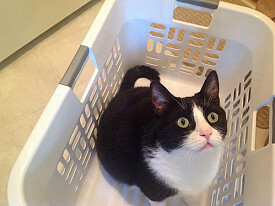 If you haven't been sweating or getting dirty while working on some complex electrical project, why not stick something back in the closet for another go-around before you consign it to the laundry basket? 9. Hooray, no more ironing! Ironing uses energy and can scorch clothing at the wrong heat. So stop doing it! If you're concerned about wrinkles, hang clothes immediately after washing to allow the natural weight to pull wrinkles out; when they're completely dry, fold along the lines where you want creases and put neatly away under other garments, which will keep them pressed and smooth. If you're leaving clothes hanging for long periods, be aware that cheap wire hangers can be hard on your clothing. Why not invest in some quality wooden or padded hangers instead? Dry cleaning uses harsh chemicals, harms fibers, and is expensive! Many fabrics designated "dry clean only" can actually be hand washed with mild soap (not detergent, which may break down fibers and cause shrinking and other problems). Use cool water, hand wash gently, and lay your garments flat to dry.